Roy D. Marshall, 70 years old, passed away February 8, 2019 at St. Francis Cabrini Hospital in Alexandria, LA. Funeral services will be held on February 15, 2019, at Jeane’s Funeral Service Chapel at 1:00 PM under the direction of Jeane’s Funeral Service. Visitation will be held on February 15, 2019 from 10:00 AM until service time at Jeane’s Funeral Chapel, 100 E. Union St, Leesville, LA. Mr. Marshall was born May 16, 1948 in Evansville, IN to Mary and James Woodrow Marshall. 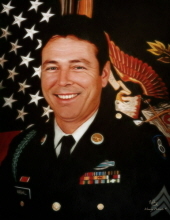 Mr. Marshall served in the United States Army 10 years and 9 months as an infantry man serving in the Vietnam War. Mr. Marshall worked at Bayne Jones Army Hospital as supervisor to Hospital Kleen until he retired. To send flowers or a remembrance gift to the family of Roy David Marshall, please visit our Tribute Store. "Email Address" would like to share the life celebration of Roy David Marshall. Click on the "link" to go to share a favorite memory or leave a condolence message for the family.